I’ve been blogging for several months now and I’m glad to have recieved the feedback I have. I’ve enjoyed the experince and for that reason I’ve decided to take blogging to another level. I’ll be self hosting my blog and that means you’ll see a lot more creativity in the design, functionality and layout of the new blog. I wish all my professors could have explained things this easily. WINNER OF 26 INTERNATIONAL AWARDS! 10 Audience Choice Awards including the 2004 Sundance Film Festival. Provoking, witty, stylish and sweepingly informative, THE CORPORATION explores the nature and spectacular rise of the dominant institution of our time. Part film and part movement, The Corporation is transforming audiences and dazzling critics with its insightful and compelling analysis. Taking its status as a legal “person” to the logical conclusion, the film puts the corporation on the psychiatrist’s couch to ask “What kind of person is it?” The Corporation includes interviews with 40 corporate insiders and critics – including Noam Chomsky, Naomi Klein, Milton Friedman, Howard Zinn, Vandana Shiva and Michael Moore – plus true confessions, case studies and strategies for change. Along with the groundbreaking 145-minute theatrical version of the film, the two-disc DVD has eight hours of never-before-seen footage. In addition to two commentary tracks, deleted scenes, and Q’s-and-A’s, 165 new clips and updates are sorted “by person” and “by topic.” Get the details you want to know on the issues you care about. Then, check out the web links for follow-up research and action. THE CORPORATION is Canada’s most successful documentary… EVER! The film is based on the book The Corporation: The Pathological Pursuit of Profit and Power by Joel Bakan. The triple bottom line (abbreviated as “TBL” or “3BL“, and also known as “people, planet, profit“) captures an expanded spectrum of values and criteria for measuring organizational (and societal) success: economic, ecological and social. 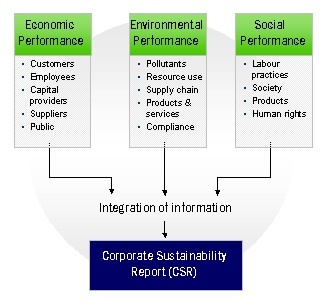 In the private sector, a commitment to corporate social responsibility implies a commitment to some form of TBL reporting. This is distinct from the more limited changes required to deal only with ecological issues. In practical terms, triple bottom line accounting means expanding the traditional reporting framework to take into account ecological and social performance in addition to financial performance. The concept of TBL demands that a company’s responsibility be to stakeholders rather than shareholders. In this case, “stakeholders” refers to anyone who is influenced, either directly or indirectly, by the actions of the firm. According to the stakeholder theory, the business entity should be used as a vehicle for coordinating stakeholder interests, instead of maximizing shareholder (owner) profit. “People, planet and profit” succinctly describes the triple bottom lines and the goal of sustainability. “People” (human capital) pertains to fair and beneficial business practices toward labour and the community and region in which a corporation conducts its business. A TBL company conceives a reciprocal social structure in which the well being of corporate, labour and other stakeholder interests are interdependent. A triple bottom line enterprise seeks to benefit many constituencies, not exploit or endanger any group of them. The “upstreaming” of a portion of profit from the marketing of finished goods back to the original producer of raw materials, i.e., a farmer in fair trade agricultural practice, is a not unusual feature. In concrete terms, a TBL business would not use child labour and monitor all contracted companies for child labour exploitation, would pay fair salaries to its workers, would maintain a safe work environment and tolerable working hours, and would not otherwise exploit a community or its labour force. A TBL business also typically seeks to “give back” by contributing to the strength and growth of its community with such things as health care and education. Quantifying this bottom line is relatively new, problematic and often subjective. The Global Reporting Initiative (GRI) has developed guidelines to enable corporations andNGOs alike to comparably report on the social impact of a business. “Planet” (natural capital) refers to sustainable environmental practices. A TBL company endeavors to benefit the natural order as much as possible or at the least do no harm and curtail environmental impact. A TBL endeavor reduces its ecological footprint by, among other things, carefully managing its consumption of energy and non-renewables and reducing manufacturing waste as well as rendering waste less toxic before disposing of it in a safe and legal manner. “Cradle to grave” is uppermost in the thoughts of TBL manufacturing businesses which typically conduct a life cycle assessment of products to determine what the true environmental cost is from the growth and harvesting of raw materials to manufacture to distribution to eventual disposal by the end user. A triple bottom line company does not produce harmful or destructive products such as weapons, toxic chemicals or batteries containing dangerous heavy metals for example. Currently, the cost of disposing of non-degradable or toxic products is borne financially by governments and environmentally by the residents near the disposal site and elsewhere. In TBL thinking, an enterprise which produces and markets a product which will create a waste problem should not be given a free ride by society. It would be more equitable for the business which manufactures and sells a problematic product to bear part of the cost of its ultimate disposal. Ecologically destructive practices, such as overfishing or other endangering depletions of resources are avoided by TBL companies. Often environmental sustainability is the more profitable course for a business in the long run. Arguments that it costs more to be environmentally sound are often specious when the course of the business is analyzed over a period of time. Generally, sustainability reporting metrics are better quantified and standardized for environmental issues than for social ones. A number of respected reporting institutes and registries exist including the Global Reporting Initiative, CERES, Institute 4 Sustainability and others. “Profit” is the bottom line shared by all commerce, conscientious or not. In the original concept, within a sustainability framework, the “profit” aspect needs to be seen as the economic benefit enjoyed by the host society. It is the lasting economic impact the organization has on its economic environment. This is often confused to be limited to the internal profit made by a company or organization. Therefore, a TBL approach cannot be interpreted as traditional corporate accounting plus social and environmental impact. Social enterprises are social mission driven organizations which trade in goods or services for a social purpose. Their aim to accomplish targets that are social and environmental as well as financial is often referred to as having a triple bottom line. Social enterprises are profit-making businesses set up to tackle a social or environmental need. They often use blended value business models that combine a revenue-generating business with a social-value-generating structure or component. Many commercial businesses would consider themselves to have social objectives, but social enterprises are distinctive because their social or environmental purpose is central to what they do. Rather than maximising shareholder value, their main aim is to generate profit to further their social and environmental goals. Therefore some commentators describe them as ‘not-for-profit’ as their profits are not (at least primarily) distributed to financial investors. Others dislike the term as it suggests they have an unbusinesslike attitude. It could be that the profit (or surplus) from the business is used to support social aims (whether or not related to the activity of the business, as in a charity shop), or that the business itself accomplishes the social aim through its operation, for instance by employing disadvantaged people (social firms) or lending to businesses that have difficulty in securing investment from mainstream lenders. In Britain and North America, there is less emphasis on generating a surplus and more on the double bottom line nature of the enterprise. European usage tends to add the criterion of social rather than individual ownership. Social enterprises are generally held to comprise the more businesslike end of the spectrum of organisations that make up the third sector or social economy. A commonly-cited rule of thumb is that their income is derived from the business trading rather than from subsidy or donations. I thought this picture of Mario would be a good example of continuously improving on a product or brand and reinventing yourself along the way.